Re-link your Kroger card to help DCP! 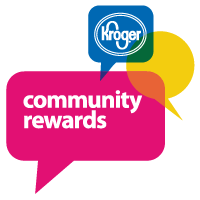 It’s time to RE-enroll/enroll to Kroger’s Community Rewards program. 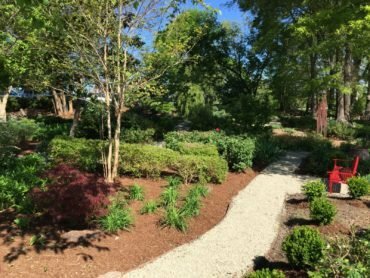 This is really important funding for Durham Central Park, your favorite non-profit and community gathering space. We’re organization #92915 and we earned more than $1200 last year, via your shopping. (We receive a percentage based on all your shopping at Kroger, except lottery, stamps and alcohol.) Thanks! 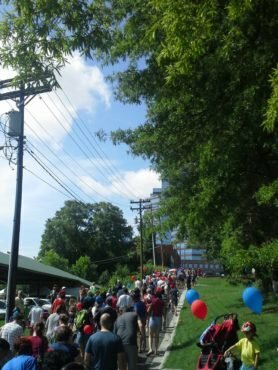 The Rickhouse’s PickleFest Benefits Durham Central Park July 31! She’s a little bit country, a little bluesy, and packs a punch behind a mircophone. Don’t miss the Triangle’s own Rissi Ralmer on WUNC’s The State of Things Friday, July 15, where she’ll be previewing her full band performance at Durham Central Park that evening. 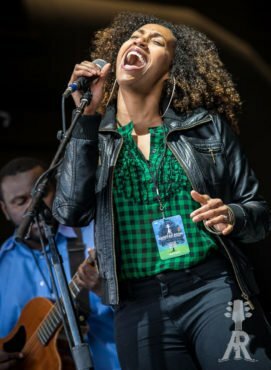 Between sets at Durham Central Park, Rissi will conduct a free “powerhouse” blues vocal workshop–all part of the 13th annual Warehouse Blues Series. Tune in to 91.5 (and other stations in eastern NC) from 12-1 p.m. Rissi’s music and interview segment begins around 12:40 p.m. Click here for more info and line up of local food trucks and beer at the show. Durham Central Park’s Warehouse Blues Series is made possible by The Blue Note Grill, Marriott Durham, Questell Foundation, Leaf Filter, Downtown Durham Inc., AARP North Carolina, Home Advisor and Cricket Wireless. 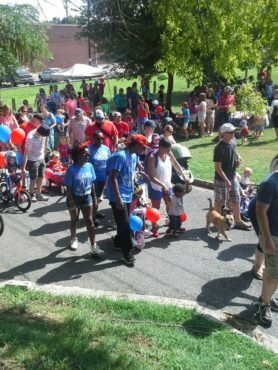 Childrens’ Independence Day Parade this Monday! 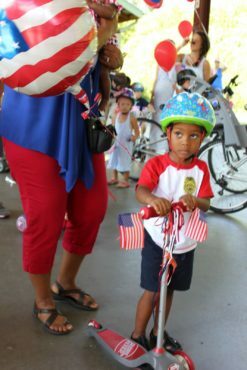 Our Annual Childrens’ Independence Day Parade is Monday! This parade is one of our longest running events at the Park. 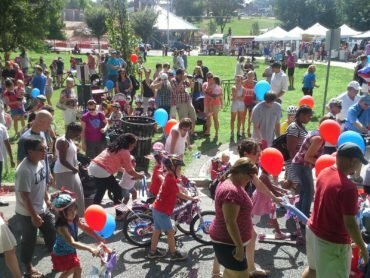 Every year, on the 4th of July, we look forward to providing a fun and free event for the community. Starting at 9:30 a.m., the Scrap Exchange will be on hand to with supplies to help kids get decorated for the parade. Bring your bike, trike, big wheels, scooter, stroller, wagon or just decorate yourself! 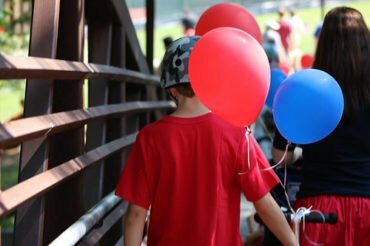 We’ll provide lots of balloons too.The parade starts at 10:30 a.m.. We will wind through the Park and over the bridge. Once we are done parading, there will be free popsicles and fire engine tours for all. DJ Piddipat will be providing the music. Below are a few highlight from past parades! We hope to see you there. Tai Chi Chuan is possibly an exponent of Shaolin Kung Fu. Shaolin Kung Fu is thought to be the combination of martial Shuai Jiao (Chinese wrestling with striking) and Yoga breathing, exercises, and meditation. Legend has it that Da Mo an Indian Buddhist monk taught this Yoga to the Shaolin monks. Chang San Feng a Daoist Priest is credited for inventing Tai Chi 1101 A.D. The style of Kung Fu was eventually passed down to the Chen Family from Chaing Fa. Chan San Feng studied at the Shaolin Temple and then revised their form of Kung Fu to match Taoist ideas. I enjoy practicing Tai Chi because it combines balance, relaxation, breathing with mobility and flexibility conditioning. Tai Chi can be meditation and it is the most complete system of self defense. Tai Chi is not difficult to do but it takes time and effort to do well. If you have a group that is interested in participating in a workday at the Park, please contact Erin. We hold 6 regular workdays each year – on the first Saturdays of April, May, June, September, October and November. We are always happy to schedule as special workday to accommodate a group. 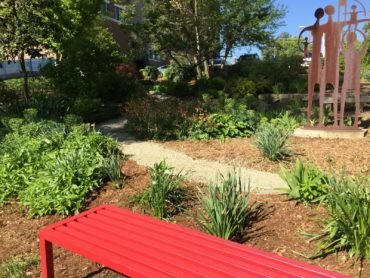 New Benches at Mt. Merrill! Have you seen the new benches and the new sign at Mt. Merrill yet? 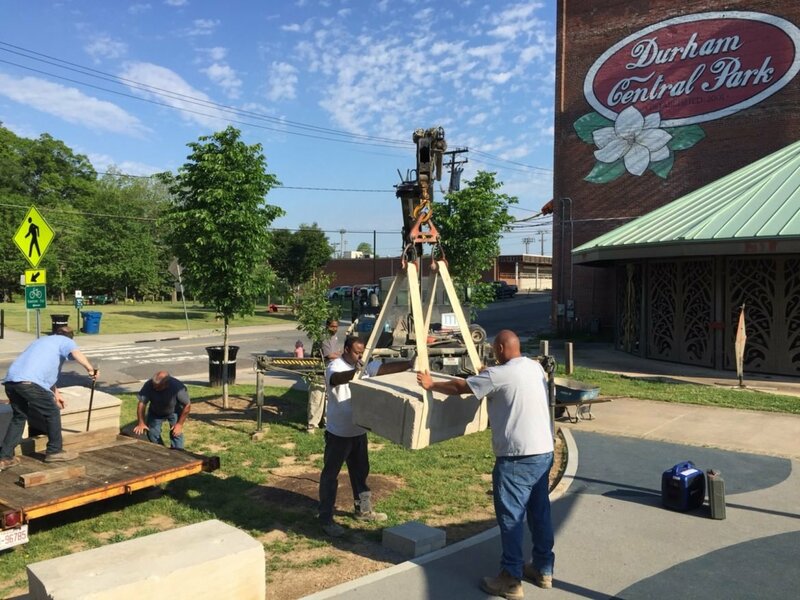 On April 26th, Al Frega and a crew from Durham Marble Works installed 5 benches and a lovely new sign at the entrance of Mt. Merrill! 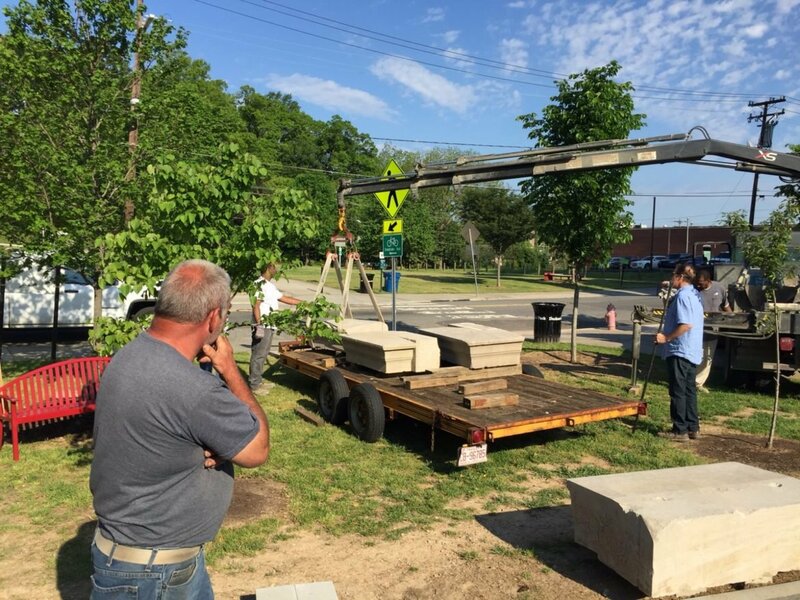 The 5 benches are made from re-claimed limestone cornice stones from the Southern Railway Freight Depot, which was once located at the intersection of Roxboro and Pettigrew (adjacent to the jail). The building was demolished in 1993 and Al go a hold of these lovely stones which are now in the Park! If you look closely at the benches, you’ll see diagonal holes in the top of each. Al told me that those holes were used to lift and place the stone. You’ll also see a mark that was engraved in one of the pieces a long time ago. Al said that those marks were used to help place the pieces. The sign was created by Ron Bartholomew at Durham Marble Works. It is made from a piece of Limestone that came from Indiana. Ron doesn’t often have the opportunity to work with limestone (he usually works with granite), but he took on the project without hesitation! As the design came together, he did some research on how to best protect the stone from wear and tear. He found that the best process was to create a limewash (crushed up limestone and water) and spread several layers over the stone. He told me that it was a very antiquated process that is not used very often anymore, since limestone is not regularly used for signs these days. 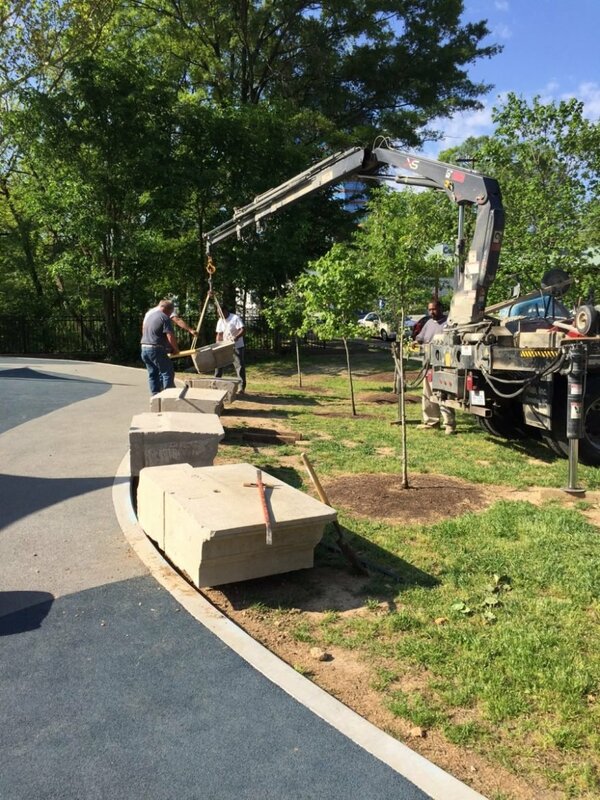 While the finished product is beautiful, the process of installing the benches and the sign was pretty fascinating. 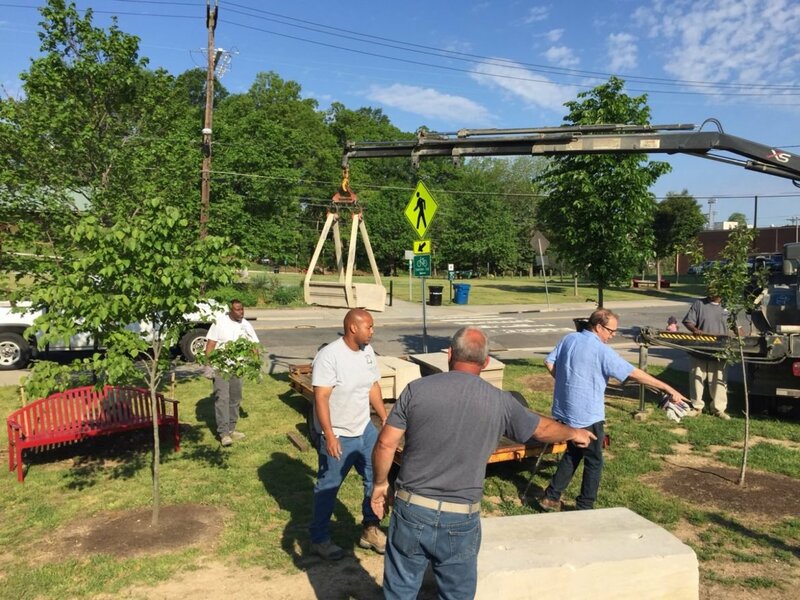 My two year old son and I spent about an hour watching the team use a crane to move the stones from the truck and install them in the Park. Enjoy the pictures below! 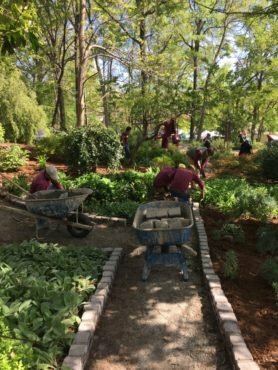 On April 16th, a large group of folks from Berkshire Hathaway Home Services and Old North State Landscaping descended upon their adopted garden in the southwest corner of the Park to do a spring spruce up! Weeds were pulled, bushes were pruned, ground was mulched, plants were planted and a new pathway was installed. It’s never been more beautiful! 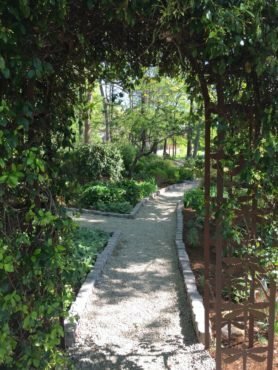 If you get a chance, take a stroll through this lovely corner of the Park. Enjoy some during and after pictures! 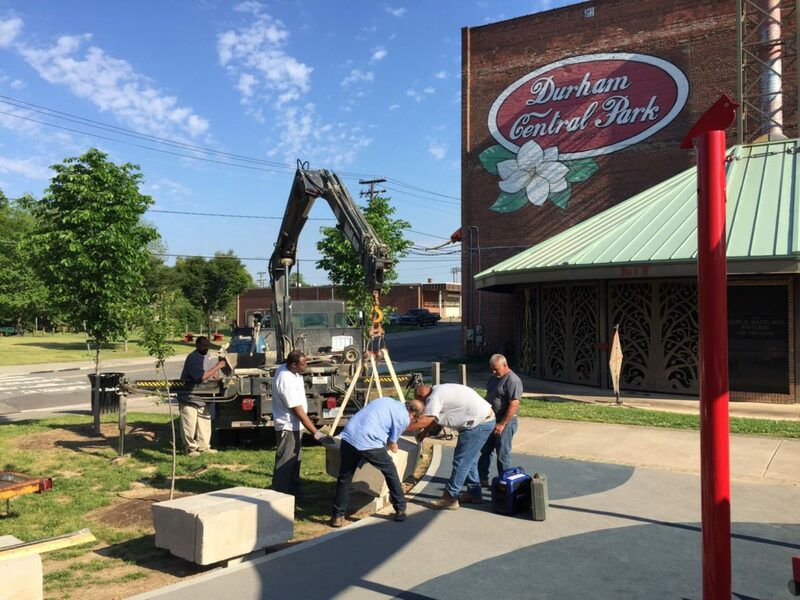 Thanks so much to Tracey Goetz, Berkshire Hathaway and Old North State Landscaping for their dedication to Durham Central Park! Adopted by the Durham Central Park Board of Directors April 20, 2016: Durham Central Park, Inc. does not and shall not discriminate on the basis of race, color, religion, gender, gender identity, gender expression, age, national original, disability, marital status, sexual orientation or military status, in any of its activities or operations or activities. These activities include, but are not limited to, hiring and firing of staff, selection of volunteers and vendors and provision of services. We are committed to providing a welcoming and inclusive environment for all members of our staff, clients, volunteers, subcontractors, consultants, vendors and the general public. 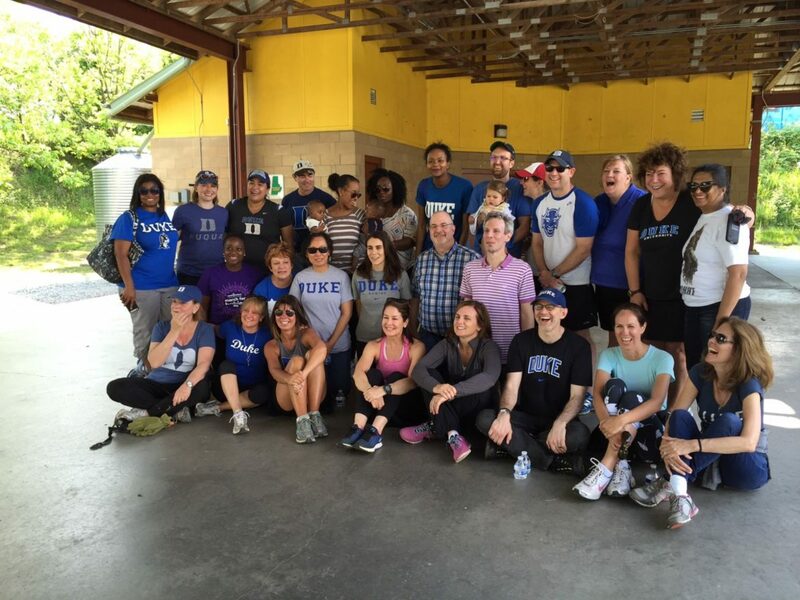 Durham Central Park, Inc. is an equal opportunity employer. We will not discriminate and will take affirmative action to ensure against discrimination in employment, recruitment and advertisements for employments, compensation, termination, upgrading, promotions, and other conditions of employment on the basis of race, color, gender, national origin, age, religion, creed, disability, veteran’s status, sexual orientation, gender identity, gender expression or genetic information. It happened so fast…The Park exploded into beauty and activity after a (seemingly brief) winter rest! 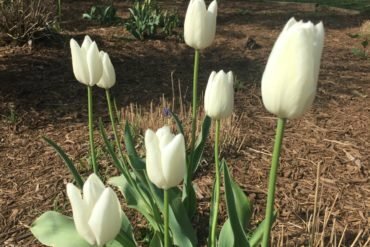 Over the past few weeks, every time I’ve visited the Park, I’ve been greeted with scenes of bulbs blooming and fruit trees in flower, kids enjoying Mt. Merrill, people picnicking on the lawn, and a very busy skate park. I’m convinced that the Turtle looks even happier now that spring is here! 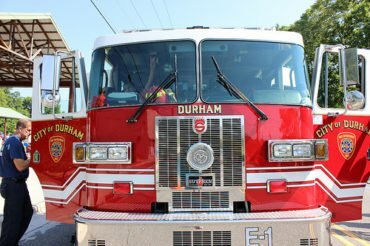 The Durham Farmers’ Market is back in summer mode! Saturday summer hours of 8am-Noon have resumed a couple of weeks ago. Next week, the Wednesday Market opens next week and will run through mid-October with the hours of 3:30- 6:30pm. 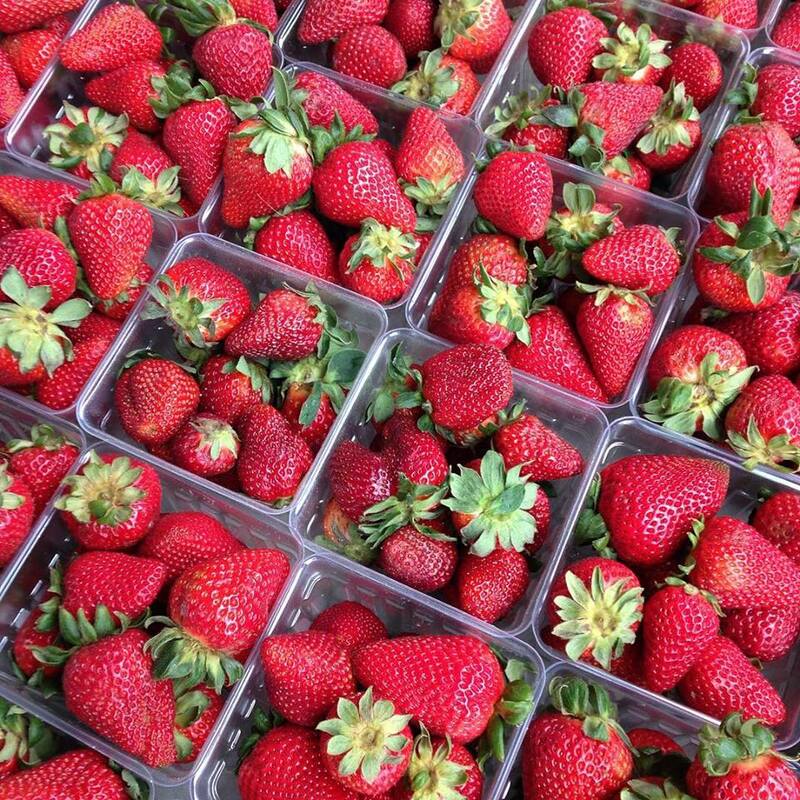 Important note: STRAWBERRIES are now in season and are as sweet as can be! The Durham Craft Market has returned! This summer, Blue Point Yoga will be offering free, all level yoga classes from 9-10am every Saturday from May 7 to August 27. Classes will be held in a NEW location: on the east side of Foster Street between the Skate Park and The Leaf in the shade. July 1: MAKING ART IN THE UNIVERSE. 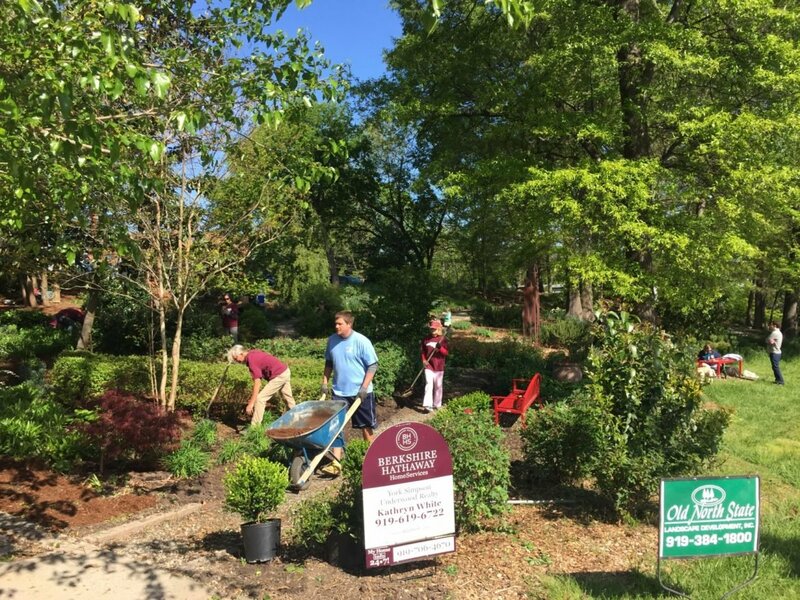 Spring Volunteer Workdays Saturdays May 7 & June 4, 9am-Noon. 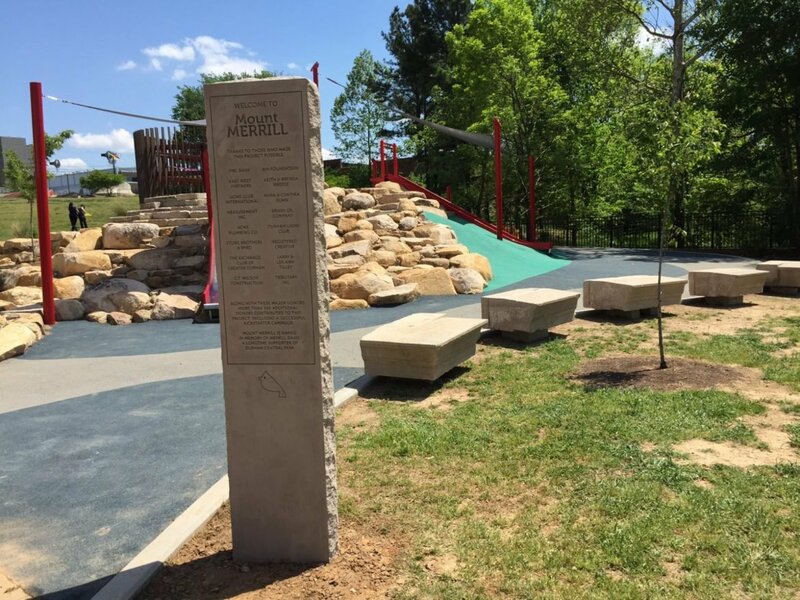 Help keep the Park beautiful and clean for everyone to enjoy. 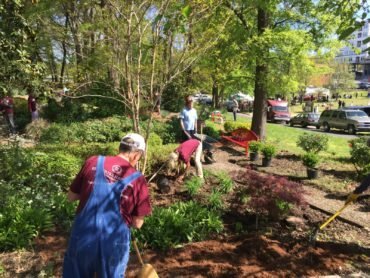 Once a month, a crew of volunteers helps with planting, gardening, and general beautification around the Park. 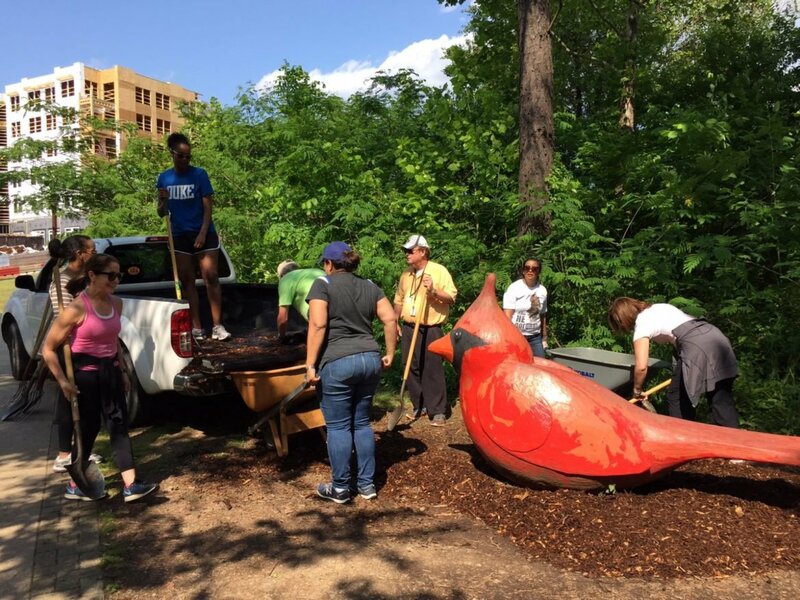 Get your hands dirty and meet some new folks who love the Park as much as you do. While there is lots of activity in the Park, you’ve probably noticed more activity just outside of the Park too. A new construction project has broken ground along the southwest corner of the Park. The Brannan, a 30 unit condominium, will be our new neighbors on Hunt Street. Construction should last about 18 months. Over at the former Liberty Warehouse site, the big red crane is still moving around and the Liberty Warehouse Apartments are coming together fast. Recently, I met the owners of the bowling alley/restaurant that will be on ground floor on Foster Street. It is a locally owned business and they already have locations in Raleigh and Charleston. They are nice folks and will be a fun addition to the neighborhood. Liberty Warehouse construction is scheduled to be finished by the fall.